Cayde-6 is the Hunter Vanguard member who is responsible for tracking and assigning bounties to high-value targets. He gives Guardians jobs such as take out Askor, Archon Priest, or the Psion Flayers. You can find Cayde-6 in the Vanguard Hall in the Tower with the rest of the Vanguard. He offers Hunters Vanguard weapons and armour, and is easily the funniest character in the Destiny Universe. Cayde-6 pleads with Guardians under his breath and out of earshot of the other Vanguard for them to take him with them, though it’s clear he would never abandon his post while there’s good to be done. Cayde-6 was once human, and while he remembers little of his life before the collapse, he does have some memories. Whatever he can recall is mixed up and in the wrong order, and some aren’t even his own memories. Beginning life as a human soldier with a large debt on his head, he was approached by Clovis Bray to have the debt removed. While Cayde-6 can’t remember the job offer or anything about he, the next memory he has is being taken to Europa where he was converted into an EXO. Another memory, possibly after becoming an EXO, sees him assigned to security duty for the Ishtar Collective where he was looking after Dr, Maya Sundaresh. Cayde-6 wanted to get to know the doctor better but she never noticed him. The final memory Cayde-6 has is of being restrained by a shadowy creature on a destroyed world, followed by a memory he says is not is own. Once Cayde-6 was an adventurous Guardian, and even now he dislikes his ‘desk job’ with the Vanguard, but realises it serves the greater good. He lost the notorious Vanguard Dare, but only took over the role of Hunter Vanguard when his predecessor and close friend Andal Brask was murdered by by Taniks, The Scarred, a Fallen mercenary. As Cayde-6 yearns to be out in the wilds with every Guardian, he longs most to see the inner workings of the Vault of Glass. 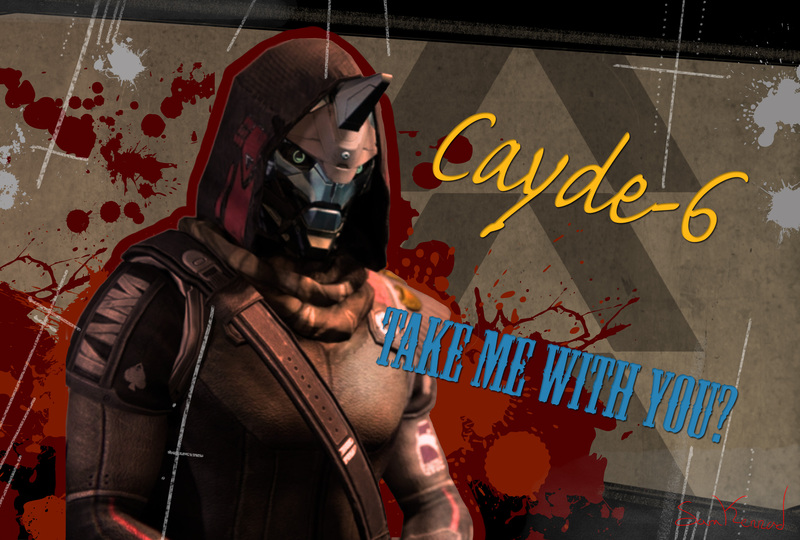 In The Taken King storyline Cayde-6 plays an important part in the Guardians gaining access to Oryx’s Dreadnaught. He helps the Guardian obtain a Stealth Drive against the wishes of the other Vanguard members. The Stealth Drive itself is stolen from the War Mind Rasputin, and the ship it is fitted to has been borrowed from Eris Morn without permission. Cayde-6 and Eris have a mutual distaste for each other from this point onwards, even today Eris refuses to forgive him for destroying her ship. As part of The Dawning Cayde-6 offers his assistance to Ikora Ray and the Guardians when they’re called to take on Omnigul and Sekiron, Nexus Mind. however, this is more of an effort to avoid leading a team of Hunters who hate him. Previous articleDestiny Xur’s Inventory: Should You Buy Truth?